1878 Jeppe Map of the Transvaal (South African Republic) in South Africa. WE SELL ONLY ORIGINAL ANTIQUE MAPS - NOT REPRODUCTIONS JOIN OUR WEEKLY MAILING LIST FOR NEWEST STOCK. Title: Map of the Transvaal and the Surrounding Territories. 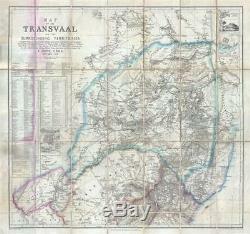 Description: This is a beautiful and scarce 1878 map of the Transvaal or the South African Republic by F. It covers the Boer ruled country in South Africa from modern day Zimbabwe south as far as Durban and depicts the Transvaal, Orange Free State and Griqualand West as well as parts of Natal, Zululand and Basutoland. The map renders the region in extraordinary detail, noting native tribes, goldfields, mines, roads, towns, farms, bushes, forests, lakes and a host of important topographical features. The routes of various travelers, including Erskine, Sanderson, Hope, Mauch and several others are noted throughout. A table of postal routes in included near the left margin. A table showing distances and altitudes of projected railway lines is also included. The upper right quadrant of the map features two insets featuring the'Plan of Lourenco Marques Del. Bay' and a'Continuation of Mauch's route to the ruins of Zimbabwe' along with a'View of the ruins. Another inset in the left lower quadrant features a'Plan of Pretoria. This map was made two years before the First Boer War or the First Anglo-Boer War. The Transvaal and the Orange Free State were recognized as independent states by the British since 1852 and 1854 respectively. The region became the center of attention in 1867 with the discovery of diamonds near the Vaal River, which would lead the British to annex West Griqualand despite Boer protests. In 1877, despite a treaty granting its independence, the British annexed the Transvaal, which led to the First Boer War fought between the British Empire and the independent Boer republics of the Orange Free State and the Transvaal Republic. The war would end with the Pretoria Convention where the Transvaal Republic and the Orange Free State would regain independence. This map was compiled from all the available official and private information and the latest observations and exploring Routes of C. Cohen, and combined with his own observations during fifteen years residence in the country, by F. The map was engraved Edward Weller and published by S.
Size: Printed area measures 23.5 inches high by 25 inches wide. Dissected and mounted on linen. Map exhibits red stains along left fold lines, where map is attached to binder. Folds into original cardboard binder. If your address is a P. DHL International EXPRESS (45 USD). We can use your Federal Express Account. Duty varies by country and we cannot predict the amount you will be charged. Services include deacidification cleaning flattening and backing. The item "1878 Jeppe Map of the Transvaal (South African Republic) in South Africa" is in sale since Friday, September 21, 2018. This item is in the category "Antiques\Maps, Atlases & Globes\Africa Maps".